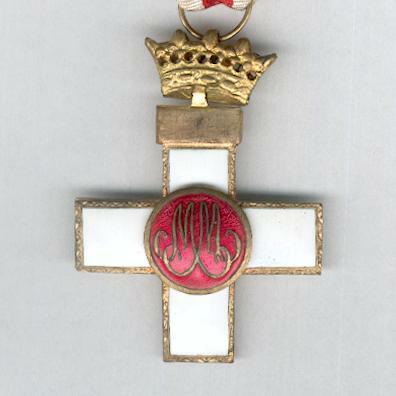 Gilt-edged white enamel Greek cross on swivel civic crown suspension of the Franco era; the face with an imposed circular central gilt-edged medallion in red, white and blue enamel and gilt metal bearing an escutcheon quarterly of Castile and Léon with Granada overall; the reverse with a circular central gilt-edged red enamel medallion imposed bearing the initials ‘MM’ (for Mérito Militar); on original ribbon with gilt ‘pasador’ top bar mounted for wear. 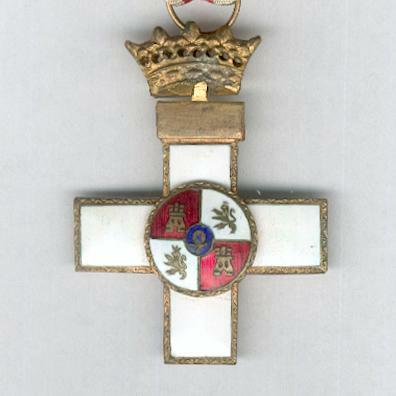 The Order was created by Queen Isabel II in 1864 to be awarded for military merit. 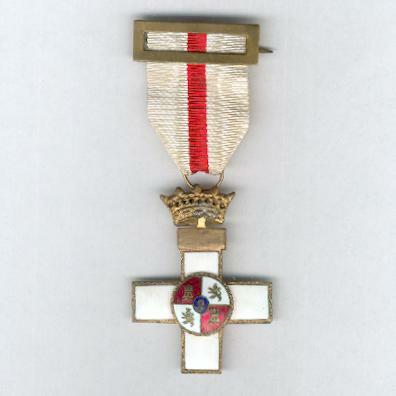 The cross is of white enamel in times of peace, and of red in times of war. This is good example is from the Franco era, 1938 to 1975.